Suara Timor Lorosa’e, November 10, 2010 language source: Tetun - Acting State Secretary for the East Timor Council of Ministers, Avelino Coelho, said the Parliamentary Majority Alliance (AMP) Government would not regulate or intervene in the work of journalists. “I believe that with code of ethics for journalists which is being discussed by the journalists will have no perception that the Government will regulate the work of journalists,” Coelho said. 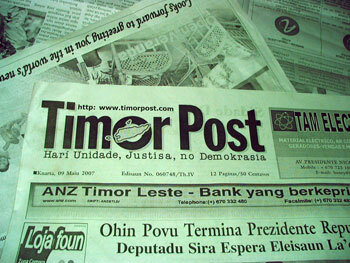 Coelho added that the Government’s role was to approve the draft of this code of ethics which would be submitted by the Timorese Journalists Association AJTL). Dn't know its good or bad.